Benicio Del Toro, Patricia Arquette, and Paul Dano-starring limited series 'Escape At Dannemora' will be premiering on Showtime in a little over a month. Ahead of this much-anticipated debut of the seven-part series, the network has released an official poster and a telling behind-the-scenes video. The series is based on real-life events of the Clinton Correctional Facility escape in the June 2015. 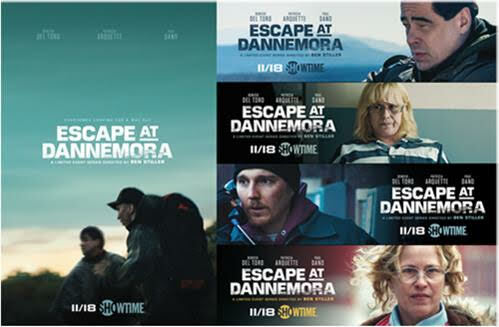 Titled 'Inside Escape at Dannemora', the preview shines the spotlight on the three central characters, convicted murdered Richard Matt (Del Toro), convicted cop-killer David Sweat (Dano), and a working-class prison employee Tilly Mitchell (Arquette), who together mastermind the grand escape from the New York facility. Based on the stranger-than-fiction prison break in upstate New York in the summer of 2015, 'Escape at Dannemora' follows the headline-making statewide manhunt for the two convicted murderers who were aided in their escape by a married female prison employee who reportedly carried on months-long affairs with both men. "Working or being in a prison is a really intense thing," says Arquette in the behind-the-scenes footage explaining the making of the Showtime limited series. "You just don't wanna be in jail, it goes to this other level," chimed in Del Toro, adding that at the core of the prison-break drama is a "twisted, twisted love story." "'Escape at Dannemora' is about two inmates, Richard Matt, and David Sweat, who with the help of a civilian worker Mitchell escaped out of Clinton Correctional in June of 2015," adds Emmy winner Ben Stiller, who is directing the series as well as executive producing it alongside Michael De Luca, Bryan Zuriff, Nicky Weinstock, and Bill Carraro. "What drew me to the story was the reality of the story," adds Stiller. Check out the promo behind-the-scenes clip below. Showtime's 'Escape at Dannemora' also stars Golden Globe and Emmy nominee Bonnie Hunt, acclaimed actor Eric Lange and Emmy nominee David Morse and is set to release on Sunday, November 18 at 10 pm.